Good morning and happy spring! 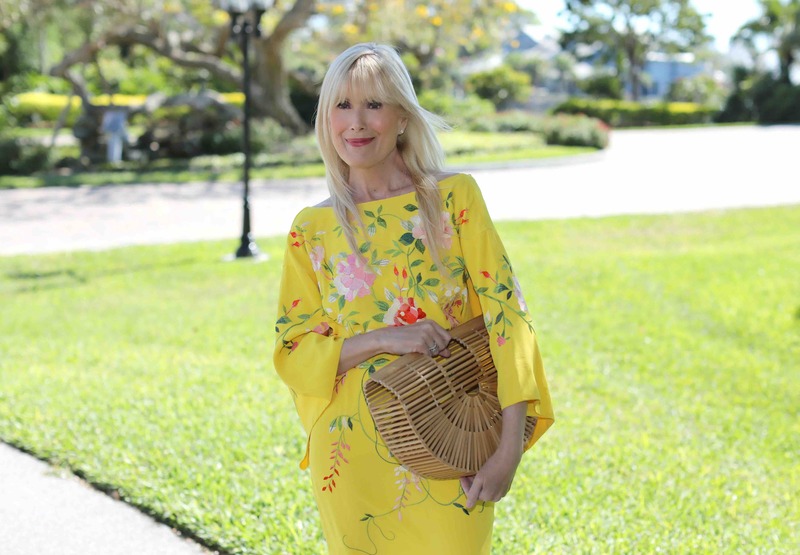 Welcoming the new season in a bright yellow floral dress with kimono-style sleeves. This is one I’ve been waiting to wear for a while now. I picked it up at ASOS in January. Wish I could tell you that it’s still available but when you’re talking fast fashion things disappear, well, fast. Luckily spring florals are everywhere this season and I’ve linked to some of my favorites at the bottom of this post. Beautiful color… fantastic dress you wear so well.! Mary—I have to say that this yellow is such a fabulous color on you! I’m sure I’m biased, but yellow is my favorite color and it’s so lovely!! What a great spring outfit! Love that handbag and dress! What a fun, happy dress. I love the embroidery! What an adorable dress Mary. I just love a yellow dress and even more so if it’s embellished like this one. The kimono sleeves add that extra punch – what a find! I have a yellow shift similar to this and seeing yours makes me yearn to get it out from storage, sadly the temperature isn’t quite as balmly as yours yet. Wow, gorgeous, Mary!!! Loving this yellow on you…perfect way to celebrate the first day of spring! Thank you for sharing this fabulous outfit with us at On Mondays We Link-Up!! Such a darling dress!!! I’m so glad you can finally wear it! Beautiful look Mary, love the dress and it looks amazing on you. adorable! love that sunny yellow. This dress is fabulous girl! What a way to kick off Spring! You look so beautiful, bright and sunny! Amazing look dear!! You are so cute with this yellow dress! Have a lovely day! You and that stunning yellow embroidered dress look like a million bucks. I wish I could buy that beauty! Happy Spring to you gorgeous Mary!! Beautiful dress!Really love the scenery too! Stunning! Wow, that dress is so pretty – the print, the color, the silhouette – love it! I know it’s cliche, but love yellow for spring too. It’s such a happy color! What an amazing dress! I love the color and the detail! It looks fabulous on you! This dress and color is amazing!!! It’s a shame things fly out the door so quickly. But understandable with this number. Great piece to own! Visiting from the Fab Favorites linkup. Beautiful Spring dress! You take beautiful photos! That dress is fabulous! Love the sleeves! You look lovely in yellow! such a beautiful dress. love the bright yellow! Hoping by from Catherine’s link-up to let you know how much I adore your dress. It looks great on you! I am pretty sure I must have liked it on your Insta account, too. You know, I am not a huge fan of yellow because it does not suit me at all. But thank you for the inspiration.